Jungle Red Writers: What We're Writing Week--Deborah Crombie, TO DWELL IN DARKNESS, At Last! What We're Writing Week--Deborah Crombie, TO DWELL IN DARKNESS, At Last! DEBORAH CROMBIE: I'm in roughly the same place in the book process as our Jungle Red Lucy Burdette. Only, her new Haley Snow, Death with All the Trimmings, comes out in December, and Kincaid/James #16, To Dwell in Darkness, comes out September 23rd! What this tells you is that I was very slow and that the book is now in a crunch production schedule. This isn't fun for anyone, writer or publisher. Note to self: WRITE FASTER. Stick copies of note on keyboard and mirrors... BIG NOTE! This also means I barely drew a breath between turning in the last chapter of the manuscript and starting my own and my editor's revisions, and that I had more editorial revisions sandwiched in with the copy edit. A terrifying combination! Much writerly angst! "Will everyone hate it? What will I do then???" Fortunately, that didn't turn out to be the case. 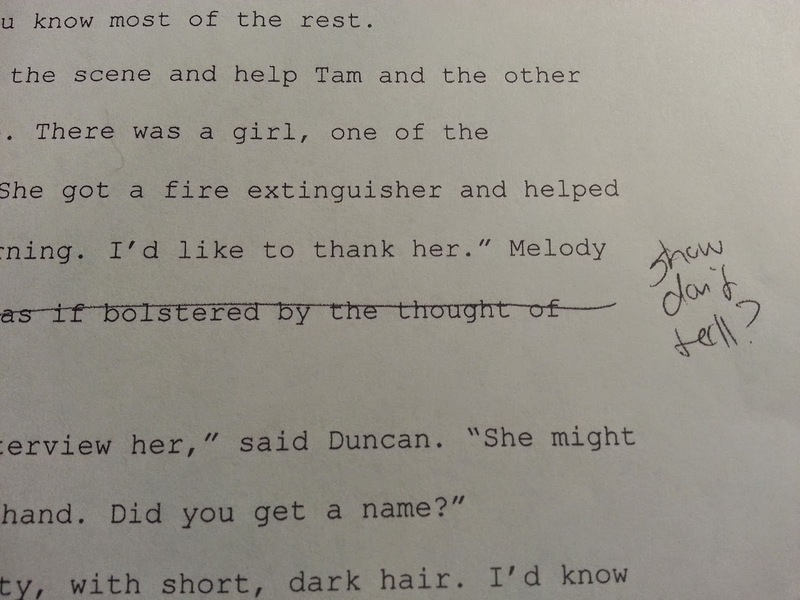 (Or at least if my copy editor hated it, she didn't say so.) My editor is quite happy with it, I think. WHEW. And now, tomorrow, just over a week after I turned in the copy edit, I will get page proofs. For non-writers out there, these are the type-set pages. You are only reading for little errors that might have slipped through the copy edit, or errors in type-setting or transcription. It's very expensive to make big changes at this stage and very much frowned upon. Unlike the terrifying copy edit, I love reading the page proofs. It's the first time that an author gets to experience what they've written as a real BOOK. Not only have all the editing changes been incorporated, but you see the design of the book (font, chapter heads, etc.) for the first time. So what's next? I'm plotting Kincaid/James #17. I have a working title, which my editor and my agent both like, but I'm not quite sure I'm ready to share it. I have a start date for writing actual pages written in RED on my calendar. August 4th. So hold me to it. London was miserably cold for mid-March. There were a few hardy crocuses showing their heads in the parks and private gardens, but hard frost had nipped the daffodils and turned the early blossoms on the fruit trees crystalline. Detective Superintendent Duncan Kincaid walked to Southhampton Row from Holborn tube station, his coat collar turned up, neck swaddled in a wool scarf, gloved hands shoved deep in his overcoat pockets. The sky was as dark as gunmetal, and when he turned east into Theobald’s Road, a blast of wind almost pushed him off his feet. Lowering his head, he trudged on. The weather boffins said the wind was blowing from the Siberian steppes—he wondered if he should consider one of those Russian hats with the earflaps. At least he now understood why the Russians wore the silly-looking things. He quickened his pace as the concrete bulk of Holborn Police Station came into view. Although its architectural design might have come straight from the Gulag, it at least promised warmth. Holborn station. His home away from home for more than two weeks now, yet he still felt as displaced as he had on his first awkward day. And as angry. Returning to Scotland Yard from paternity leave in mid-February, he’d found his office empty. He’d been transferred from his longtime job as head of a homicide liaison team at the Yard to an area major-incident team based here in Holborn. It was a demotion, although he had kept his rank. There had been no warning and no explanation. His immediate superior, Chief Superintendent Denis Childs, had been called out-of-the-country on a family emergency. That had added a second worry atop the first, as Kincaid and his family had been letting Childs’s sister Liz’s home in Notting Hill while her husband worked a five year contract in Singapore. Kincaid had come to like Liz Davies, although they had only communicated via email. He hoped that the out-of-country emergency didn’t include her. With Kincaid’s transfer to Holborn, Doug Cullen, Kincaid’s detective sergeant, had been moved into a data-entry job at the Yard, ostensibly to accommodate his recovery from a broken ankle. Now, Kincaid faced adjusting to a new job without Cullen’s capable, nerdy presence. Losing a good detective sergeant—a partner with whom you spent more hours than you did with your spouse—ranked, in his opinion, close to divorce on the scale of life disruptions, and there’d been no compensating honeymoon with his new team. As if conjured up by his thoughts, he glimpsed his new detective constable, George Sweeney, trotting down the steps of the LA fitness gym across the street from the police station. Fresh from his morning workout, Sweeney wore a three-piece suit that was too expensive for a constable’s salary, and no overcoat. His short hair was still damp and trendily spiked, his cheeks red from his healthy exertion. “Morning, Guv’nor,” Sweeney said, overly hearty, as they both reached the station entrance. “You look like death warmed over,” he added, squinting at Kincaid. “A little too much partying?” Sweeney added with a wink and what came much too close to a nudge. By God, the man was irritating. “Sick child,” Kincaid said shortly. Their three-year-old foster daughter, Charlotte, had a bad cough, and he and Gemma had taken turns to sit up with her. Kincaid felt a sting on his cheek, and then another. The lowering sky had begun to spit sleet. And just for the record, I failed the compound word test. Almost every single decision I made turned out to be wrong. How do my fellow REDS fare on the compound word challenge? Or should it be "compound-word"? It's interesting that proofing digitally is different from proofing from a paper copy. Okay, now it's going to be hard to wait until September to find out what happens with Duncan [but thanks for that wonderful smidgen] . . . .
Duncan and Gemma - YAY! One of my favorite literary couples (you knew that), and I've missed them. Cannot wait!!!!!! Such great insight Deborah. As one who works on the other side of things (academic journal production), it's nice to hear that some authors really do understand that extreme cost of changes during the later proofing stage. Can't tell you how many of my authors want to re-write something at that point. Understandable, since they are working on academic articles, but no less expensive. You titles are always intriguing, so I can't wait to hear what you have in mind for the next book. I'm pretty decent on compound words, but I credit my day job for that (and editing almost everybody else's work). Wonderful snippet. My father recently discovered Gemma and Duncan, and he really likes them. And my father is a notoriously picky reader, so kudos to you! Well Debs, I'm just glad I wasn't on your schedule! We will check in with you on the 4th and make sure you are writing:). but you have a big book tour coming up too, right? that has to be distracting! So glad to hear the book's almost here, Deb! I hope you get a little down time to celebrate in between all of the work. Kristopher, I've always taken the instruction not to make editorial changes in the proof stage as gospel! Lucy, I'd like to have a hundred pages done by the time I go on tour. I will try to sneak it bits here and there, but I'm going to be touring for about five weeks, and I don't write well on planes. Then two weeks after my last event, I'm off to Bouchercon! Do you get your copy edit in Word Track Changes, too? Thank you, Reds, for the Coming Attractions! My "book fund" will soon be taking a hit! Love the excerpt -- I could feel and see the weather -- and the new character! Great. The process sounds so challenging -- how much confidence and energy you must have to face all of the hurdles. Is it September 23 yet?? I can't wait. What hard work you all go through for us readers. Thank you. Eagerly anticipating the new book, Debs. And compound words? Just never get them right (as in my headline on Wednesday : multitasking/ multi-tasking/multi tasking etc. Also commas. My copy editor goes berserk with commas. That is a tight schedule! I'm going to borrow your technique on copy edits for my next round. I did the printed out thing for page proofs, but I would like to catch a few of those things earlier. 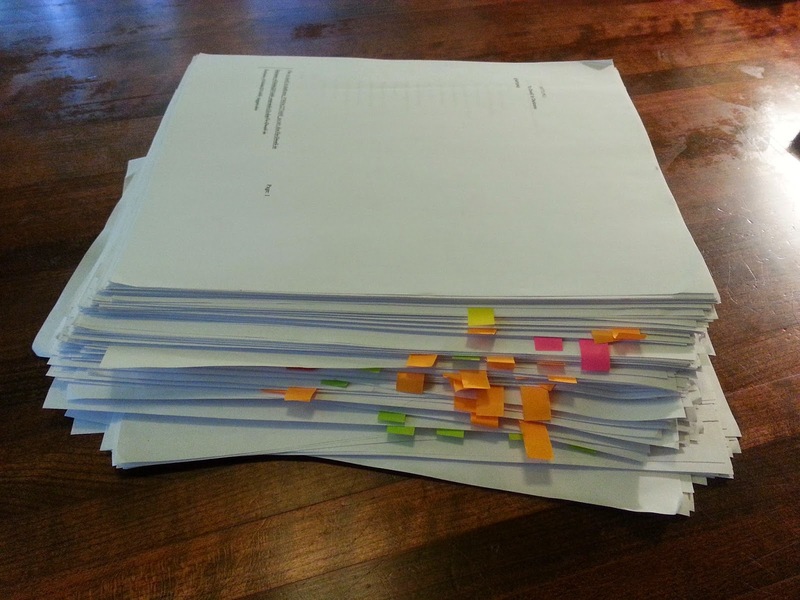 With my nonfiction for ThingsAsian Press, I get my edits back in Track Changes. But for The Map of Lost Memories, I got SO lucky with an old school editor who did everything on an actual page. There is something so so satisfying about exchanging edits in handwriting - each person's handwriting has its own personality, and I felt as if it was a kind of conversation my editor and I were having about my book. I admire all of you Jungle Reds so much for the pace you keep. I don't think I could write a book in less than 2 years, though I'm working on getting faster. Some day I'd love to read a week's worth of posts on how each of you keep such a steady pace and maintain quality at the same time. I'm up to And Justice There is None in your series, so won't be reading the new one until I've read the others leading up to it. I absolutely LOVE your series! Debs, I became instantly ensconced into the setting and Duncan's worries. How could anyone mistreat our dear Duncan and demote him like that? I want to find that person and give him/her a piece of my mind. I told you I became involved at once. Hehehe! I can hardly wait to get my hands on a copy of To Dwell in Darkness. Oh, the work you authors do apart from creating a wonderful story, and your tight time frame steps that up even more, Debs. Of course, some people work better under the pressure of such a time frame. Whatever you do, just keep doing it, because the end result is always perfect. Compound words confound me a bit these days. I think it's due largely to the constant compounding we do of words that were normally not compounds that makes it more difficult. Also, there doesn't seem to be many consistent rules concerning new compounds. I need to study this area further. Yes, once again, I love to study grammar, and I am that nerd. Now, to eagerly await To Dwell in Darkness, I will be in pounce mode for it. Thanks, Kathy, and Kim! I hope the quality is there, but I certainly fall down on the "steady pace" part. I'd love to hear how the rest of the REDS do it so well! I must get caught up with this series! That opening grabbed me immediately. I want to know what is going on with the powers-that- be at Scotland Yard. Can't wait to read To Dwell in Darkness. The excerpt is very unsettling. "What We're Writing Week" is a favorite. It's always interesting to read about each author's approach to similar situations and demands. Compound words? Ask for a house style sheet. Go with what they want (they're paying). If they say Chicago Manual of Style, buy the new one (it's a deductible expense). What doesn't kill you makes you stronger. I wrote the 85,000-word Constitution book in 6 weeks flat, because the pre-writing reading took me a month, and the month before that (which should have been devoted to reading) was devoted to research (actually finding the right books). So yes, the edited manuscript was in my hands before I had a chance to do laundry, and the page proofs were there almost before the laundry could dry. I feel for you. Can't wait for this, Deborah! I'm fascinated by the line numbers in your print out. I've never done that before. Is it very helpful? Anyone out there know which Psalm? Lisa, I've used line numbers in my manuscript template for years. It's extremely helpful, especially if you have friends who reads the novel in draft, as they can point out errors or make comments by both page and line number. It should be easy to set up if you use Word. Boy, do I know what you mean about the crazy schedule. I'm still not completely unpacked from my three weeks in London, and I've been home since June 6th! "he hath made me to dwell in darkness, as those that have been long dead." Thanks, Joan! People will ask me, so I should know! I love the language in the King James version. So beautiful, isn't it? Deb, that is great atmospheric description! I've been in London in March twice when it was freezing cold and sleeting (and boy, does it get dark early) so that brought back memories. I was staying in that same area both times. I experienced a scary incident in a spaghetti restaurant early one evening close to Holburn St. I felt like Duncan was dwelling in darkness in not knowing what had happened to his job during his leave! I pre-ordered "To Dwell in Darkness" some time ago. Does it come out in the UK and the US at the same time? I'm so excited to get my hands on it. I enjoy learning about the business of books. As reader, I never realized how much work goes into the finished book. I understand why authors write one book a year. Although as as reader, I would like to have them more often. The wait for a new Duncan/Gemma book is definitely worth it...one of my favorite series. Loved the taste of TO DWELL IN DARKNESS, Debs! I can't wait to hold it in my hands. 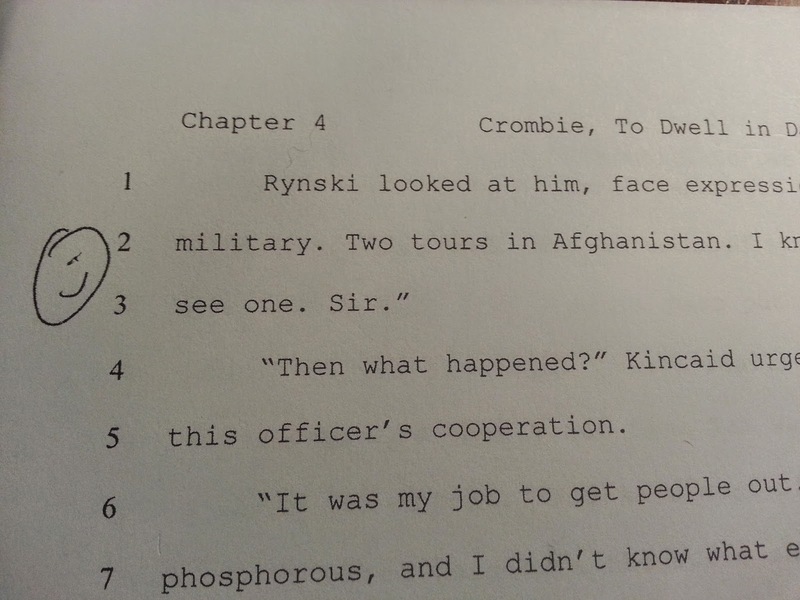 My publisher still uses paper copy edits, and I'm delighted about it. I've done lots of freelance editing on the computer, but I will always prefer to have the hard copy. Like you, I find things then that I miss when it's just on the computer screen. I may have to try your practice of line numbers. I can see how that would be useful. The Bechdel Test — Do Your Favorites Pass? Ice Cream, Ice Cream, Who Screams for Ice Cream?